Systems providing additional frontal protection for motor vehicles have been increasingly used in recent years. Some of these systems constitute a risk to the safety of pedestrians and other road users in the event of a collision. Measures are therefore required in order to safeguard the public against such risks. Frontal protection systems can be provided as original equipment fitted to a vehicle or marketed as separate technical units. The technical requirements for the type approval of motor vehicles with regard to any frontal protection systems that might be fitted to the vehicle should be harmonised in order to prevent the adoption of requirements that vary from one Member State to another and to ensure the proper functioning of the internal market. For the same reasons, it is necessary to harmonise the technical requirements for the type approval of frontal protection systems as separate technical units within the meaning of Council Directive 70/156/EEC of 6 February 1970 on the approximation of the laws of the Member States relating to the type-approval of motor vehicles and their trailers (3). It is necessary to control the use of frontal protection systems and to establish the test, construction and installation requirements to be complied with by any frontal protection system either supplied as original equipment fitted to a vehicle or placed on the market as a separate technical unit. Tests should require that frontal protection systems are designed in a way that improves pedestrian safety and reduces the number of injuries. These requirements should also be regarded in the context of the protection of pedestrians and other vulnerable road users and with reference to Directive 2003/102/EC of the European Parliament and of the Council of 17 November 2003 relating to the protection of pedestrians and other vulnerable road users before and in the event of a collision with a motor vehicle (4). The present Directive should be reviewed in the light of further research and experience gained during the first four years of its application. This Directive is one of the separate Directives within the framework of the EC type-approval procedure established by Directive 70/156/EEC. The Commission should monitor the impact of this Directive and report to the European Parliament and the Council. If it is deemed necessary to achieve further improvements in pedestrian protection, the Commission should make proposals to amend this Directive in accordance with technical progress. It is recognised, however, that certain vehicles included in the scope of this Directive, and to which frontal protection systems may be fitted, will not be subject to Directive 2003/102/EC. For such vehicles it is considered that the upper leg test requirements of this Directive may be technically unfeasible. To facilitate an improvement in pedestrian safety, with respect to head injury, it may be necessary to allow alternative requirements for the upper leg test, for application to those vehicles only, whilst ensuring that the installation of any frontal protection system does not increase the risk of leg injury to pedestrians or other vulnerable road users. The measures necessary for the implementation of this Directive and for its adaptation to scientific and technical progress should be adopted in accordance with Council Decision 1999/468/EC of 28 June 1999 laying down the procedures for the exercise of implementing powers conferred on the Commission (5). Since the objective of this Directive, namely to promote the safety of pedestrians and other vulnerable road users through laying down technical requirements for the type-approval of motor vehicles as regards frontal protection systems, cannot be sufficiently achieved by the Member States and can therefore be better achieved at Community level, the Community may adopt measures in accordance with the principle of subsidiarity as set out in Article 5 of the Treaty. In accordance with the principle of proportionality, as set out in that Article, this Directive does not go beyond what is necessary in order to achieve this objective. This Directive is part of the European road safety action programme and may be supplemented by national measures to prohibit or restrict the use of frontal protection systems already on the market before its entry into force. The purpose of this Directive is to improve pedestrian and vehicle safety through passive measures. It lays down technical requirements for the type-approval of motor vehicles as regards frontal protection systems supplied as original equipment fitted to vehicles or as separate technical units. ‘separate technical unit’ means any separate technical unit within the meaning of Article 2 of Directive 70/156/EEC and intended for installation and use on one or more types of vehicles. prohibit registration, sale or entry into service. prohibit sale or entry into service. 3. With effect from 25 November 2006, in respect of a new type of vehicle fitted with a frontal protection system, or a new type of frontal protection system supplied as a separate technical unit, which does not comply with the requirements laid down in Annex I and Annex II, Member States shall refuse to grant EC type-approval or national type-approval. prohibit the registration, sale or entry into service of new vehicles which are not accompanied by a certificate of conformity in accordance with Directive 70/156/EEC. 5. With effect from 25 May 2007, the requirements under Annex I and Annex II relating to frontal protection systems made available as separate technical units, shall apply for the purposes of Article 7(2) of Directive 70/156/EEC. 1. Detailed technical requirements for the test provisions laid down in paragraph 3 of Annex I shall be adopted by the Commission in accordance with the procedure referred to in Article 13(3) of Directive 70/156/EEC. 2. Amendments necessary for adapting this Directive shall be adopted by the Commission, in accordance with the procedure referred to in Article 13(3) of Directive 70/156/EEC. Not later than 25 August 2010, in the light of technical progress and experience, the Commission shall review the technical provisions of this Directive and, in particular, the conditions for requiring the Upper Legform to Frontal Protection System test, the inclusion of an Adult Headform to Frontal Protection System test and the specification of a Child Headform to Frontal Protection System test. The results of this review will be the subject of a report from the Commission to the European Parliament and the Council. If, as a result of this review, it is considered appropriate to adapt the technical provisions of this Directive, such adaptation shall be carried out in accordance with the procedure laid down in Article 13(3) of Directive 70/156/EEC. Annexes I, III, IV and XI to Directive 70/156/EEC are hereby amended in accordance with Annex III to this Directive. 1. Member States shall adopt and publish, by 25 August 2006 at the latest, the laws, regulations and administrative provisions necessary to comply with this Directive. They shall forthwith inform the Commission thereof. They shall apply those provisions from 25 August 2006. When Member States adopt those provisions, they shall contain a reference to this Directive or be accompanied by such reference on the occasion of their official publication. Member States shall determine how such reference is to be made. This Directive shall not affect the Member States' competence to prohibit or to restrict the use of frontal protection systems placed on the market as separate technical units before the entry into force of this Directive. (1) OJ C 112, 30.4.2004, p. 18. (2) Opinion of the European Parliament of 26 May 2005 (not yet published in the Official Journal) and Council Decision of 11 October 2005. (3) OJ L 42, 23.2.1970, p. 1. Directive as last amended by Commission Directive 2005/49/EC (OJ L 194, 26.7.2005, p. 12). in so far as they may be considered to have an effect on the validity of the results of the impact tests prescribed in this Directive. ‘upper frontal protection system height’ means the vertical distance between the ground and the upper frontal protection system reference line, defined in paragraph 1.9 with the vehicle positioned in its normal ride attitude. where ‘a’ is the resultant acceleration at the centre of gravity of the head (m/s2 as a multiple of ‘g’, recorded versus time and filtered at a channel frequency class 1 000 Hz; t1 and t2 are two times defining the beginning and the end of the relevant recording period for which the value of HPC is a maximum between the first and last instants of contact. Values of HPC for which the time interval (t1 - t2) is greater than 15 ms are ignored for the purposes of calculating the maximum value. The following requirements apply equally to frontal protection systems as supplied fitted to new vehicles and to frontal protection systems supplied as separate technical units for fitting to specified vehicles. However, with the agreement of the competent approval authority, the requirements contained in paragraph 3 can be considered to have been satisfied wholly or in part by any equivalent testing carried out on the frontal protection system pursuant to another type-approval directive. The components of the frontal protection system shall be so designed that all rigid surfaces which can be contacted by a 100 mm sphere, have a minimum radius of curvature of 5 mm. The total mass of the frontal protection system, including all brackets and fixings, shall not exceed 1,2 % of the mass of the vehicle for which it is designed, subject to a maximum of 18 kg. The height of the frontal protection system, when fitted to a vehicle, shall be no more than 50 mm higher at any point than the bonnet leading edge reference line, as defined in paragraph 1.8, measured on a vertical longitudinal plane through the vehicle at that point. The frontal protection system shall not increase the width of the vehicle to which it is fitted. If the overall width of the frontal protection system is more than 75 % of the width of the vehicle, the ends of the system shall be turned in towards the external surface in order to minimise the risk of fouling. This requirement is considered to be satisfied if either the frontal protection system is recessed or integrated within the bodywork or the end of the system is turned so that it is not contactable by a 100 mm sphere and the gap between the end of the system and the surrounding bodywork does not exceed 20 mm. Subject to paragraph 2.1.4, the gap between the components of the frontal protection system and the underlying external surface shall not exceed 80 mm. Local discontinuities in the general contour of the underlying body (such as apertures in grilles, air intakes, etc.) shall be ignored. At any lateral position across the vehicle, in order to preserve the benefits of the vehicle bumper, the longitudinal distance between the most forward part of the bumper and the most forward part of the frontal protection system shall not exceed 50 mm. The frontal protection system shall not reduce significantly the effectiveness of the bumper. This requirement shall be considered to be satisfied if there are no more than two vertical components and no horizontal components of the frontal protection system overlapping the bumper. The frontal protection system shall not be inclined forward of the vertical. The top parts of the frontal protection system shall not extend upwards or rearwards (towards the windscreen) more than 50 mm from the bonnet leading edge reference line of the vehicle, as defined in paragraph 1.8, with the frontal protection system removed. Each point of measurement is made on a vertical longitudinal plane through the vehicle through that point. Conformity with the requirements of other vehicle type-approval directives shall not be compromised by the fitting of a frontal protection system. Frontal protection systems that are separate technical units may not be distributed, offered for sale or sold unless accompanied by a list of vehicle types for which the frontal protection system is type approved and clear assembly instructions. The assembly instructions shall contain specific instructions on installation including fixing modes for the vehicles for which the unit has been approved and to enable the approved components to be mounted on that vehicle in a manner that complies with the relevant provisions of paragraph 2.1. Lower Legform to Frontal Protection System. The test is performed at an impact speed of 40 km/h. The maximum dynamic knee bending angle shall not exceed 21,0°, the maximum dynamic knee shearing displacement shall not exceed 6,0 mm, and the acceleration measured at the upper end of the tibia shall not exceed 200 g.
However, with respect to frontal protection systems approved as separate technical units for use only on specified vehicles of total permissible mass not exceeding 2,5 tonnes which have been type approved before 1 October 2005, or vehicles of total permissible mass exceeding 2,5 tonnes, the provisions of paragraph 3.1.1 may be replaced by the provisions of either paragraph 3.1.1.1.1 or paragraph 3.1.1.1.2. The test is performed at an impact speed of 40 km/h. The maximum dynamic knee bending angle shall not exceed 26,0°, the maximum dynamic knee shearing displacement shall not exceed 7,5 mm, and the acceleration measured at the upper end of the tibia shall not exceed 250 g.
Tests are performed on the vehicle with the frontal protection system fitted and without the frontal protection system fitted at an impact speed of 40 km/h. The two tests shall be performed in equivalent locations as agreed with the relevant test authority. The values for the maximum dynamic knee bending angle, the maximum dynamic knee shearing displacement and the acceleration measured at the upper end of the tibia shall be recorded. In each case the value recorded for the vehicle fitted with the frontal protection system shall not exceed 90 % of the value recorded for the vehicle without the frontal protection system fitted. If the lower frontal protection system height is greater than 500 mm this test must be replaced by the Upper Legform to Frontal Protection System test, as specified in paragraph 3.1.2. Upper Legform to Frontal Protection System. The test is performed at an impact speed of 40 km/h. The instantaneous sum of the impact forces with respect to time shall not exceed 7,5 kN and the bending moment on the test impactor shall not exceed 510 Nm. The Upper Legform to Frontal Protection System test shall be carried out if the lower frontal protection system height at the test position is more than 500 mm. However, with respect to frontal protection systems approved as separate technical units for use only on specified vehicles of total permissible mass not exceeding 2,5 tonnes which have been type approved before 1 October 2005, or vehicles of total permissible mass exceeding 2,5 tonnes, the provisions of paragraph 3.1.2 may be replaced by the provisions of either paragraph 3.1.2.1.1 or paragraph 3.1.2.1.2. The test is performed at an impact speed of 40 km/h. The instantaneous sum of the impact forces with respect to time shall not exceed 9,4 kN and the bending moment on the test impactor shall not exceed 640 Nm. Tests are performed on the vehicle with the frontal protection system fitted and without the frontal protection system fitted at an impact speed of 40 km/h. The two tests shall be performed in equivalent locations as agreed with the relevant test authority. The values for the instantaneous sum of the impact forces and the bending moment on the test impactor shall be recorded. In each case the value recorded for the vehicle fitted with the frontal protection system shall not exceed 90 % of the value recorded for the vehicle without the frontal protection system fitted. If the lower frontal protection system height is less than 500 mm this test is not required. Upper Legform to Frontal Protection System Leading Edge. The test is performed at an impact speed of up to 40 km/h. The instantaneous sum of the impact forces with respect to time, to the top and the bottom of the impactor, should not exceed a possible target of 5,0 kN and the bending moment on the impactor should not exceed a possible target of 300 Nm. Both results shall be recorded for monitoring purposes only. Child/Small Adult Headform to Frontal Protection System. The test is performed at an impact speed of 35 km/h using a 3,5 kg headform test impactor for the child/small adult. The headform performance criterion (HPC), calculated from the resultant of the accelerometer time histories, in accordance with paragraph 1.15, shall not exceed 1 000 in all cases. Application for EC type-approval of a vehicle type in respect of it being fitted with a frontal protection system. A model of the information document required, pursuant to Article 3(1) of Directive 70/156/EEC, is given in Appendix 1. A vehicle representative of the type of vehicle, fitted with a frontal protection system, for which the approval is required, shall be submitted to the technical service responsible for type-approval. At the request of the technical service, specific components or samples of materials used shall likewise be submitted. Application for EC type-approval in respect of frontal protection systems considered to be separate technical units. A model of the information document required, pursuant to Article 3(4) of Directive 70/156/EEC, is given in Appendix 2. One sample of the type of frontal protection system to be approved shall be submitted to the technical service responsible for the type-approval tests. Should the service consider it necessary, it may request further samples. The samples shall be clearly and indelibly marked with the applicant's trade name or mark and the type designation. Provision shall be made for the subsequent compulsory display of the EC type-approval mark. Appendix 4 for applications referred to in paragraph 1.2. Every frontal protection system conforming to the type approved pursuant to this Directive shall bear an EC type-approval mark. In the vicinity of the rectangle the ‘base approval number’ contained in section 4 of the type-approval number referred to in Annex VII of Directive 70/156/EEC, preceded by the two figures indicating the sequence number assigned to the most recent major technical amendment to this Directive on the date the EC type-approval was granted. In this Directive the sequence number is 01. An asterisk inserted after the sequence number will indicate that the frontal protection system was approved under the consideration, for the legform impactor test, allowed by paragraph 3.1.1.1 or 3.1.2.1 of Annex I. If this consideration is not granted by the approval authority the asterisk is replaced by a space. The EC type-approval mark shall be affixed to the frontal protection system in such a way as to be indelible and clearly legible even when the system is fitted to the vehicle. An example of the EC type-approval mark is given in Appendix 5. If the systems, components or separate technical units make use of specialist materials, information concerning their performance must be supplied. Listing of vehicle types to which it may be fitted. of a type of a vehicle with frontal protection system fitted with regard to Directive 2005/66/EC. of a type of frontal protection system as a separate technical unit with regard to Directive 2005/66/EC. 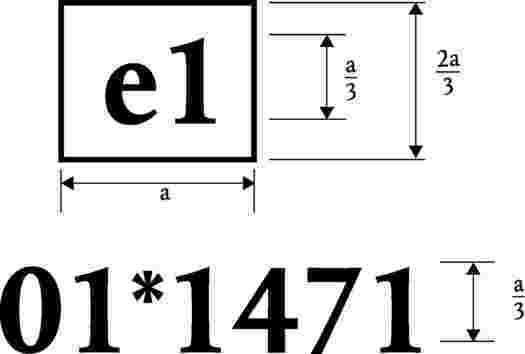 The device bearing the EC type-approval mark shown above is for a frontal protection system type-approved in Germany (e1) pursuant to this Directive (01) under the base approval number 1471. The asterisk indicates that the frontal protection system was approved under the consideration, for the legform impactor test, allowed by paragraph 3.1.1.1 or 3.1.2.1 of Annex I. If this consideration is not granted by the approval authority the asterisk is replaced by a space. A detailed description, including photographs and/or drawings, of the vehicle with respect to the structure, the dimensions, the relevant reference lines and the constituent materials of the frontal protection system and the frontal part of the vehicle shall be provided. L 309, 25.11.2005, p. 37. (2) Not exceeding 3,5 tonnes total permissible mass.